My fingernails are looking reasonable at the moment, which is pretty good considering that the house-moving stressometer is probably at its highest right now. I can usually tell if I’ve got too much on my mind by the state of my fingers. Too much biting is part of a perpetual cycle of worry – unconscious biting (for comfort) – feelings of self-loathing (because it’s so horrible a habit) – self-congratulations (when the fingers grow back) – worrying if there’s something I should be worrying about, etc. Of course, sometimes the different stages last for ages, so I can go for a while without a crisis. It’s a lifetime sentence with which finger/nailbiters will probably identify, but leaves non-biters mystified and often somewhat repulsed. I can trace it back to childhood when it was never (and probably still isn’t) regarded as self-harming. I wonder if that’s because it’s politely called ‘nailbiting’ although for many of us it’s much worse than that. I can safely say I don’t do it for attention. I’ve had hypnotherapy on more than one occasion and that is the only thing that stops it – albeit for a certain period of time. But a single session has lasted me nearly two years in the past. Chronic nail or finger biters – I recommend it HIGHLY. OK, back to the business of poetry … I seem to be having a good few days as regards writing. The recent results of the Cinnamon pamphlet competition – (reader, I flunked it) – have prompted me to look again at my submission and identify the weak links. And – joyous! – I see several. So. Looking again at some poems unattended for 6 months or more has sent me into a frenzy of revising and re-writing. I have sent out more of the individual poems. I am hoping an experienced poet will help me sharpen up the pamphlet, ready for the next submission. I’m feeling positive that many of the poems therein have merit, and I’m starting to understand what edits are needed. Good times! Submissions latest – since my last blog post on the subject I’ve heard from one of the long unheard-from mags, to say that my poems had been sent to a mystery file …? But were now winging their way to the selector for some unspecified future sifting of submissions. How magazines work is entirely a mystery to me but soon the boot will be on the Other Foot! My time as a selector for South magazine is nigh. Together with (and guided by the superior experience of) Jeremy Page of The Frogmore Papers, I will soon be reading and selecting submissions. Stay tuned for how this pans out. Readings – last week I was very pleased to be at Redroaster in Brighton to hear readings from D A Prince, Deborah Tyler-Bennet and Andie Davidson. 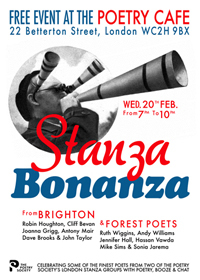 Andie is a Brighton Poetry Stanza cohort and one of my ‘loose committee’ of organisers, as well as a super poet and excellent in a workshop. Sadly I was soooo tired I was too dead on my feet to really get into the atmosphere or do any chatting, in fact it was lucky I wasn’t driving home as I think I fell asleep before we reached the car. A few dates when I’m reading: Lewes and Brighton folks, I’d love to see you at St Anne’s in Lewes on Sunday 14th June 3pm, when I’ll be taking part in a reading on the (loosely interpreted, I hope) subject of ‘Creation’, alongside Ann Segrave, Jeremy Page and Mandy Pannett. Free, with a collection afterwards. On Thursday 18th June at 7pm I’ll be at the Poetry Cafe in London for the next Telltale Poets & Friends (also FREE), reading with another lovely group of poets, namely Tamar Yoseloff, Sue Rose, Peter Kenny and our newest Telltale poet, Sarah Barnsley. I’m currently working with Sarah on producing her pamphlet and I can tell you it’s going to be big. Stand back for an early autumn launch. Then on Monday 22nd June at 7.30pm as part of the Camberwell Arts Festival I’m reading at The Crooked Well together with Richard Skinner, Josephine Corcoran and Roy Marshall. Possibly free, or nearly. No wonder poets are all skint! After that I’ll be taking a summer break from readings and the like. There’s a new home to think about, after all. « So when is the editing done? Robin, your indefatigable energy amazes me! I also flunked the Cinnamon thing and must do what you did and work out where mine was weakest! I am also a nail-biter…I think, sometimes, I’ve kicked it and can even cut my nails but then it starts up again… I havent tried anything like hypnotherapy but I’d never go to a nail bar. Trouble is, being a gardener they are often a bit earthy too! Thanks Becky – not sure about the indefatigable energy but I do my best! I’m not a gardener (yet) but I know what you mean about nail bars – they are even more of a mystery to me than the filing systems of magazine editors!